The company will deliver The Marches, a combination of one-, two-, three- and four-bedroom homes – 67 of which will be affordable – on the site of the former Wednesfield High School on Lakefield Road. Willmott Dixon is teaming up with BM3 Architecture to create the new development, with work starting on site shortly so that the first homes are ready to welcome residents in late 2019. 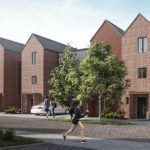 Simon Liversage, Director at Willmott Dixon, said: “We have delivered over £200 million of projects in the Midlands in recent years and our team are looking forward to working with WV Living to develop houses and apartments that bring much-needed new places to live for the people of Wolverhampton. In the process we’ll also focus on supporting regional companies and jobs with our ‘local pound’ commitment. WV Living is also developing three further sites as part of its phase one developments, with 52 homes on the site of the former Danesmore Park Primary School in Ashmore Park, 25 new homes at the former Ettingshall Primary School site, and 40 homes to be delivered at the former Prouds Lane Leisure Centre site.